How did you develop this whole new world of your characters and what can we expect for the future? This world was born somewhere deep in the recesses of my mind, for lack of a better term. Really, I don’t know what to call the thing that’s running “me”. I’m definitely going to be diving forehead first into the Szolites. I plan to finish writing Zeniel (book 2) and I’m starting Ianthen (book 3) right after. I also have a lot other stories I’m going to be working on. Dyletri, God of Fertility, has locked away his powers. No woman is allowed to touch him, not until he can return his long-dead lover back to life. All he has to do is sacrifice one human girl, a girl who unlocks his powers and rips his dormant lust right out of his body. Trapped by his promise, Dyletri has no choice but to watch Ismini die, no matter how much he wants her. Yet the darkness of his calling is spiraling within him, demanding he claim the human as his. If he goes back on his promise, the energy of the Fates will cause untold destruction in the Universe. That doesn't change how Dyletri’s begun exhibiting symptoms that point to more than just lust. How does he allow Ismini to die when she’s come to own him from the inside out? Desire and torment spiral into something much darker than obsession, more turbulent than an addiction, and something much more brutal than a mere soul-mating. As a war is being rekindled right under his nose, Dyletri will have to come to terms with a destiny eleven thousand years in the making. He thought he’d known what path his future would take, but he’d been wrong. Now the one woman he truly loves might pay the price for his decision. 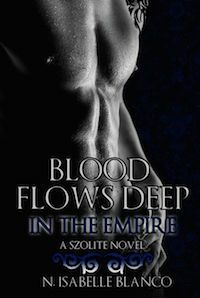 Blood Flows Deep in the Empire is the first in a series that will pit free-will against Destiny, Destiny against Fate, and love against brutal desire. Everyone likes to think they have a choice as to who they end up with, but as they rise to face the greatest threat they're ever known, even the Gods will learn they have to bend to Destiny’s whim to survive. The Writer’s Coffee Shop Publishing House has recently signed N.Isabelle's first print novel, the highly anticipated first book in the Szolite series. Blood Flows Deep in the Empire is scheduled to be released March 7, 2013 and will be available in both print and ebook formats. 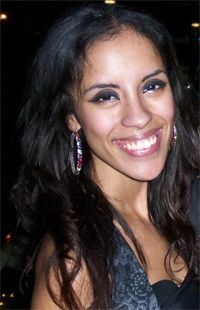 N.Isabelle Blanco, the woman who would come to be known as “Nyddi,” was born in Queens, New York. By age three, due to an odd fascination with studying her mother’s handwriting, she’d already begun to read and write. By the time she reached kindergarten, she was reading at a second-grade level, not to mention talking up a storm and showing off her extensive vocabulary. Her obsession with words and reading ended up bleeding into every aspect of her life. As she got older, romance novels took the reins of her obsession, leading her to devour every romance story she could find. Thanks to the world of Japanese Anime, N.Isabelle was introduced to the wonderful universe of Fanfiction. She would come to write fanfics on and off again as a hobby for the next ten years, but it wasn't until the Twilight phenomenon came along that she began dedicating hard hours to writing. For the next year and a half, she amassed a following that, by her own admission, she would never be able to live without. It is those fans that encouraged her to step beyond the fanfic realm and take her talent out into the publishing world. N.Isabelle’s first ebook novel, Destructively Alluring, came out in July of 2012, followed by "Addictive Lunacy" in September, and "Allure Magnified" in November of 2012. Buy links are provided as a courtesy to the reader and are not endorsed by this blog.